If you would like to see a simple list of of the maps without the screenshots, etc, visit this page. This map is a Doom tribute/dedication and the design was mainly inspired by Doom 3 although nothing is exact. 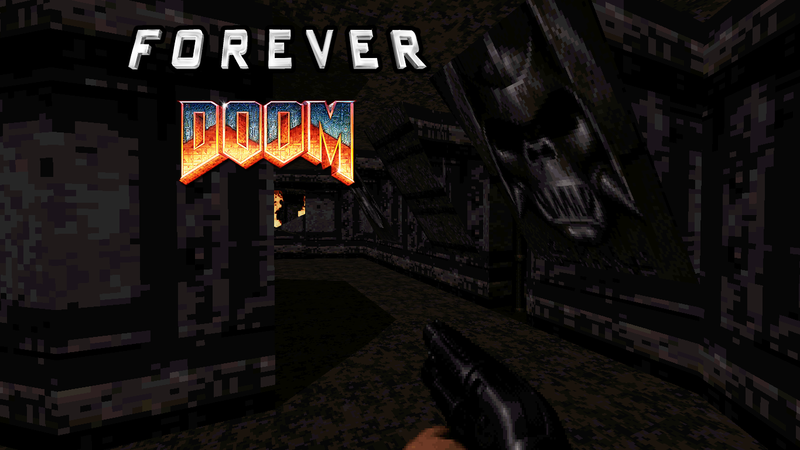 I also have added some surprises which include a few of my personal favorite areas from Doom 1 knee deep in the dead episode and one spot from Doom 2 level 1, almost making this the Ultimate Doom map! I used my prgram called cubase it is music software for producing to get all sounds out of DNF. *Story* : The Doom marine has left his hellified space base abandoned because he is out working on Doom4 those alien ba*♥♥♥♥♥ know it is a good time to take over his base. While he is away his base is being attacked and if it takes to long the base will be Forever Doomed and un fixable. So he contacts the one guy who fits the description of being able to save the day Mr. Duke Nukem. Mission: Explode the archives buildings so the aliens can’t hack the computers system and clear out any aliens for a safe return of the Doom marine . Remake of Map01 from Doom II, including DM and COOP support. This map is originally a part of my Moonbase Accident mod for Duke 3D. ‘The barn of Duke Nukem. Good for 3 or more players. Arena type map with non-stop RPG madness! Recommended 2-5 players. Classic DM map where you duke it out in a tricked out mansion! Old school map where you play as a small duke, in a billiard room! An old-school and famous map by the IOD clan. 2-4 players, pure nonstop carnage! Story: It’s Halloween and there have been reports of evil souls and demonic figures killing anyone in there path and making them join there army of darkness. Heavens hero or Hell’s janitor Daniel Garner can’t be found, word has been released that he is possessed to stay into a deep slumber forever. There is only one person with the balls of steel to go to the demonic cemetery where it all began and find his tomb for an awakening. Mr. Nukem has been contacted and when asked if he could do the job his only reply was “i see dead people”. Only the Painkiller possesses the weapon to collect there souls and put them back in there place…. HELL ! Mission: Awaken the Painkiller Daniel Garner by exploding his coffin in the underground tomb this will free his spirit. >>> Feel free to send me your comments & sugestions … !?! hall for training of the Chicago Bulls. The map is good for 2 and more players DM. DukeMatch Level : YES … !!! Known Bugs : If you find any, please E-mail me. – Authors MAY NOT use BULLS.MAP as a base to build additional levels. CD etc. ) as long as you include this TXT intact. – You MAY include BULLS.MAP in any GROUP complitations. – You may not alter the level in any way. This is a Dukematch map that came on the Total Meltdown CD Expansion Pack. I always loved it. Enjoy! no atomics no portable medkits just battle. Yo ho ho ho and a shotgun to your friend on xmas grab a beer. Old-school, very well done Library map! Another classic DM map. Sometimes goes by the name Temp. This is a old ladder map from the mid 90’s, octogon shaped arena with rpg’s at every player start, and 4 medpacks on a 6 foot platform, be mindfull not to kill your self, this is for Pro RPG users who want a good arena to duke it out in. Recommended for 1vs1, 3-8 player free for all. Classic DM map, not real sure who the author was on this. Credits can go to Fox and Nukey for ripping the maps, plus Bill Becham and Kev Harvey from Eurocom for making the maps. Turok map is based off of my memories of playing Turok (especially the N64 versions) and not a specific map. Turoks homeland has been taken over by aliens the government say’s it is to risky to send soldiers in to help a fellow hero since it is in an uncharted area and they are unaware to what dangers lie ahead. Duke loads his pistol and says “Go ahead make my day” as he begins a mission only he can do. Duke wont let this happen to a fellow hero. Single Player : The map is different then normal maps. It is a strate forward type of map with vertical gameplay this gameplay was built on purpose to feel like an adventure/journey of traveling from one place to another like Turok. This is a Duke match map from Duke Nukem 64, it is based from the map “Babe Land” pretty much an upgrade of the level and its cut in half to fit better for Duke matches. After many texture,sound, and sprite fixes i have made this map available to play on Megaton. Play now on steam http://steamcommunity.com/sharedfiles/filedetails/?id=219017246 or download straight from GravelPit! This is a Duke match map from Duke Nukem 64, it is a parody of Castle Wolfenstein and is a great map for DM. After many texture, sound, and sprite fixes i have made this map available to play on Megaton it’s not only for the 64 version anymore! Play now on steam http://steamcommunity.com/sharedfiles/filedetails/?id=216905296 or download straight from GravelPit ! Single player : Duke needs to take the city back from the aliens that have made this place there home and who ever is in charge needs to pay for that. Make sure to stop at Gun Crazy for all the good stuff you will need to make it through this infestation. Duke Match- Good for up to 8 players best with 4 and up. The map is made to fit for Duke match with a tactical yet easy to find weapons and players nature. Weapons are everywhere won’t ever be searching. Players decide where the battle can take place. A map somewhat based from the single player level Ghost Town featured in Duke Nukem Forever and Zero Hour. Nothing is an exact duplicate and is all made by me. Features a house named “Gun Crazy” (which is my own parody of the DN64) and a few other cool places. You could find the key cards and just keep going or have fun exploring the many secrets, routes, cracks portals and enemies the map has. Supports Single player/ Coop/ DM. Bullerbuller7 was my tester and helped alot. Single Player: Duke is on his way home flying over the desert when his ride is shot down once again! They are going to have to pay for that to. Duke lands in a desert town filled with ghostly spirits but of course isn’t scared. He has to fight his way out of this haunting. Before Duke himself is a ghost also. Duke Match: Good for 2-8 players and is a great size made for DM with alot of weapons and pick up to get. Can be downloaded on the steam workshop as well. You’re a tiny Duke, in a huge war! This is a rat map for Duke Nukem 3D which takes place in a kitchen. It is a Dukematch only map and can support up to 8 players. Kitchen.map actually got some some airtime in the Duke Nukem 3D Megaton Edition Multiplayer Release Trailer, check it out if you have the chance! This is an open, stadium type map I created with a colosseum theme. There are some goodies placed conveniently in the middle and other key places on the map. Lots of weapons for maximum carnage! This is a DM map that I ported from Shadow Warrior. It was not an official map but it is super fun so I figured I would post it up here. Surprisingly, it took much longer than I expected. It uses some custom sounds and gives off great atmosphere, along with fast action gameplay! In 2013 I created The Edge (q2dm1) from scratch for Shadow Warrior. This is a convertion of the Sw Map. I tried to keep the design true to the original Quake 2 map. Took me about 24 hours of creation and testing for the original map, and an additional 10 hours to get it fully converted to work with Duke3d. The lighting effect and the sprite elevator works better with eduke32 however the map also works fine with x/h and original Duke. Feeling the winter blues? Duke it out at the local pool in a sunny, bright pool environment. 😀 This is a map I released in January of 2014, updating it for nearly a month afterwards here and there. Features diving boards, main pool, childrens pool, concessions, restrooms, and a locker changing area! With the objective to foster in your face DM, this is a fast paced map geared for 2-6 players. Enjoy!